The Call for Papers is now closed! The World Association for the Advancement of Veterinary Parasitology (WAAVP) is the largest international veterinary parasitological organization in the world. WAAVP is a non-profit, organization for scientists who study helminthology, protozoology and entomology. Founded in 1963, the association is the largest international veterinary parasitology organization in the world, with membership of over 600, consisting of veterinarians, parasitologists and others interested in the area. The official organ of the WAAVP, the scientific journal Veterinary Parasitology, publishes papers dealing with all aspects of parasitic disease: prevention, pathology, epidemiology, treatment and control of parasites. The overall theme for WAAVP 2019 is Sifting and Winnowing the Evidence in Veterinary Parasitology. All abstracts must be submitted by February 22, 2019 (23:59 PST). Having considered your abstract, the scientific committee will advise if an oral presentation can be made available to you. If it cannot, a poster session opportunity may be made available. In all cases the WAAVP Scientific Committee’s decision will be final. If your paper is accepted, the scientific committee will keep you advised as to when it will be presented. Once your abstract has been submitted, you may only make changes to your authors and affiliations up to February 22, 2019. You will first be prompted to create an account. This will require your email address and the creation of a password. You will then need to click the tab to Update Contact Information. Click Create Contact to enter your personal details. At this time, you will be asked to confirm your student status (if applicable) and to select which travel award you would like to be considered for. All student registrations must be accompanied by a PDF letter signed by the head of the department/graduate chair confirming undergraduate or graduate student status along with the contact information of the supervisor. Please ensure you have this document ready. Then you can click on the Abstract Submission tab to begin submitting your abstract. A list of authors with their affiliations. Please identify the first author, or presenting author, by checking off the box, “Presenter”. You should prepare the entire contents of your abstract as a single text file (Word, TextEdit, etc.) We strongly recommend that you avoid Greek letters but instead use their text counterparts. Word count is affected when filling the text box, therefore a maximum of 300 words is allowed. Prepare the list of authors and coauthors before submitting your abstract. The first author should be the presenting author, if possible, and if not, the presenting author should be indicated. Enter all the authors associated with the abstract. When entering authors affiliations, please ensure that you use the number in the left-hand upper corner of the affiliations box. Authors are permitted to have multiple affiliations. 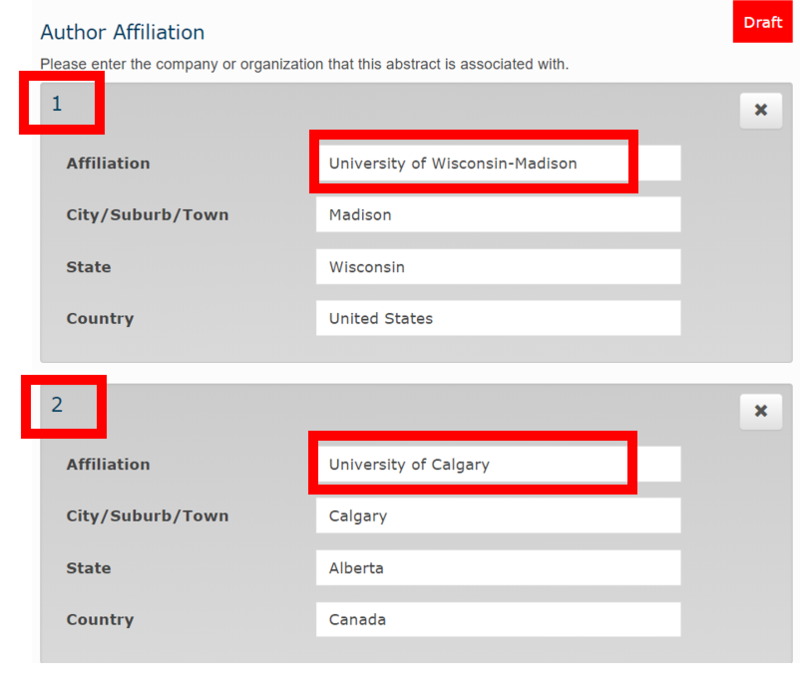 For example, if in the Author Affiliation Entry 1, you wrote University of Wisconsin-Madison. 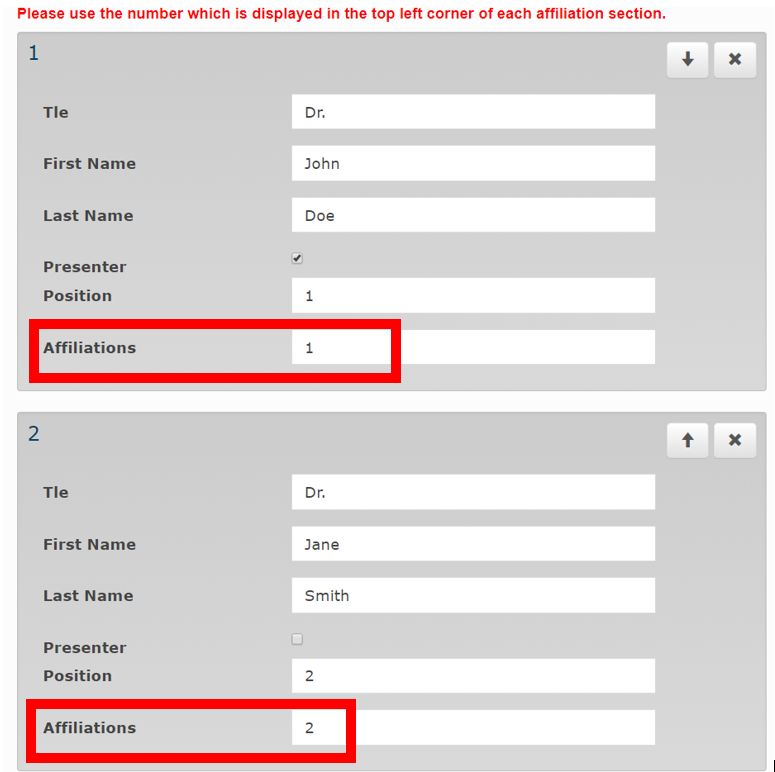 For the Abstracts Authors, if the Author has the same affiliation, please include in the Affiliations Box the corresponding number, 1. For every new affiliation added, please include the number corresponding to that affiliation in the Affiliations Box under Abstract Authors. The maximum word limit is 300. Tables and figures/graphs are not permitted. Your abstract should outline the aims, contents and conclusions of your paper/presentation. Review your submission to ensure that all details are correct. Any outstanding issues will be noted in red. IMPORTANT: Only abstracts with a “Submitted” status will be forwarded to the Abstract Review Committee after the submission deadline. It is your responsibility to submit your abstracts by clicking on the “submit” button before the deadline (February 22, 2019). Submitted abstracts cannot be modified, please review your abstract carefully before submitting it. After clicking the “Submit” button, you will receive an email confirmation of your submission. After the submission deadline, abstracts will be sent to the Abstract Review Committee. The Abstract Review Committee will decide whether the abstract is acceptable for the conference, and subsequently whether the abstract is accepted as an oral or a poster presentation based upon the final rankings. All presenting authors will receive an email notification of whether their abstracts were accepted or rejected on March 25, 2019. Please ensure that the presenter’s email address is valid and that you whitelist the Abstract and Speaker Manager’s email, WAAVP2019-Speakers@icsevents.com, in order to receive the email notification promptly. WAAVP 2019 is pleased to offer student competitions and travel awards for students. Student travel awards of up to $500 USD will be awarded at the meeting. In addition, up to 5 student abstracts will be chosen by random draw for free registration! Should you fail to meet any of the above criteria, your award application will not be considered. For any inquiries, please contact the Abstract & Speaker Manager at WAAVP2019-Speakers@icsevents.com. If your inquiry is regarding a particular draft or submission, please include the paper number and abstract title in your email.